Travelling this past week with a car full of packages, suitcases, and extra passengers meant that I had to leave my paints and papers at home while I visited family. I was fine at first and kept busy with the holidays, but by the end of the week, my creativity bones were itching. I found myself playing with the digital tools in Photoshop and eventually created this square format collage. 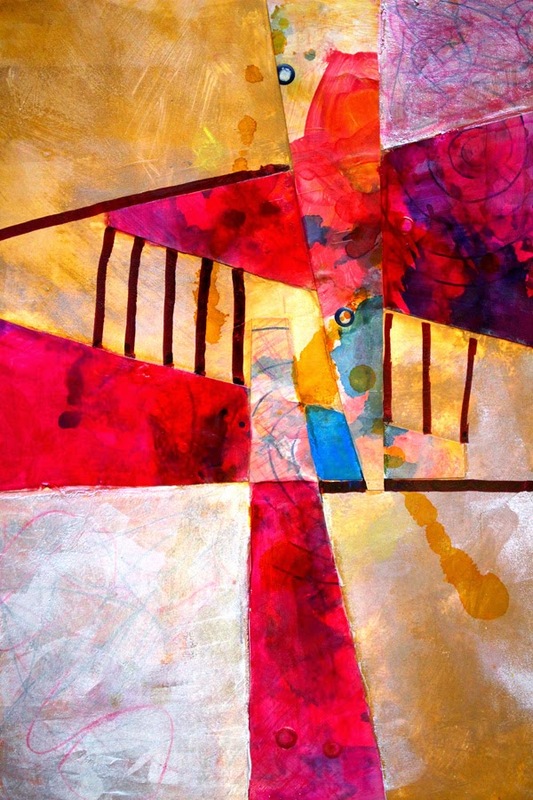 It was a delight to play with colors, shapes, and lines and I am happy with my abstract creation. The image has been uploaded to my website and is available on fine art paper, stretched canvas, or as a framed print. I'm also happy to say that it can even be reproduced as a pillow or iphone case . 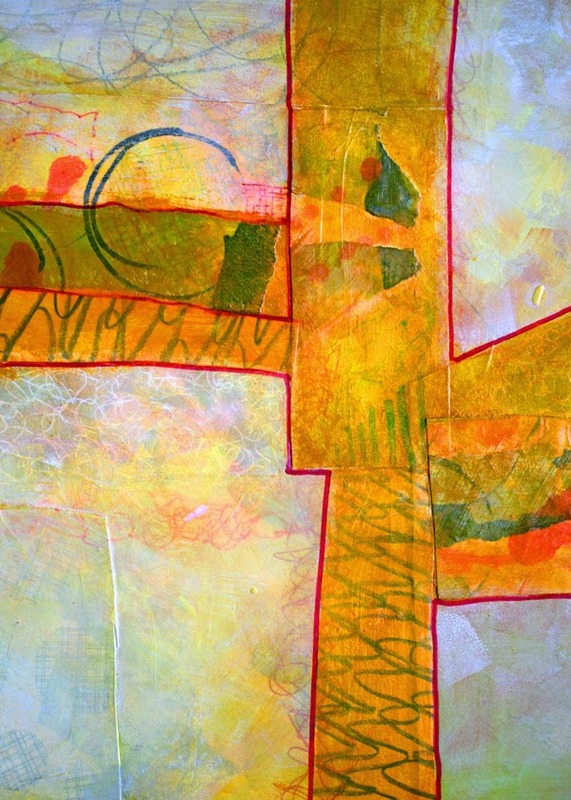 Creating handmade papers and using them in collage resulted in this abstract work. Layering paper, ink, and paint was part of the process. Lines of color, both warm and cool, helped me choose the title for the piece. I've been experimenting with paper supports hoping to find a surface that works well. This design was created on an 9x9 inch 90 lb. watercolor paper. The biggest challenge has been finding a paper that will lay flat. At first this support curled just like the rest, but about half way through the creation process, I coated the back with acrylic matte medium. It helped. The paper tried to curl back upon itself, and in the process, is almost flat. Framed, behind a piece of glass, it is beautiful. Reproduction prints are available at this link to my website or you can click on the prints tab at the top of the page to view more of my work. 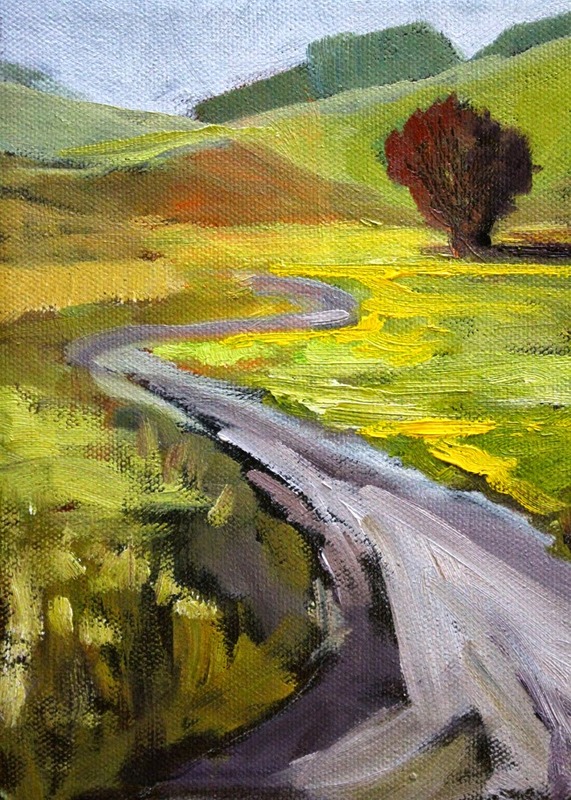 One of my favorite things to paint in the landscape are roads. They imply so many things, literally and metaphorically. Roads take us places, give us choices, and help us accomplish our goals. 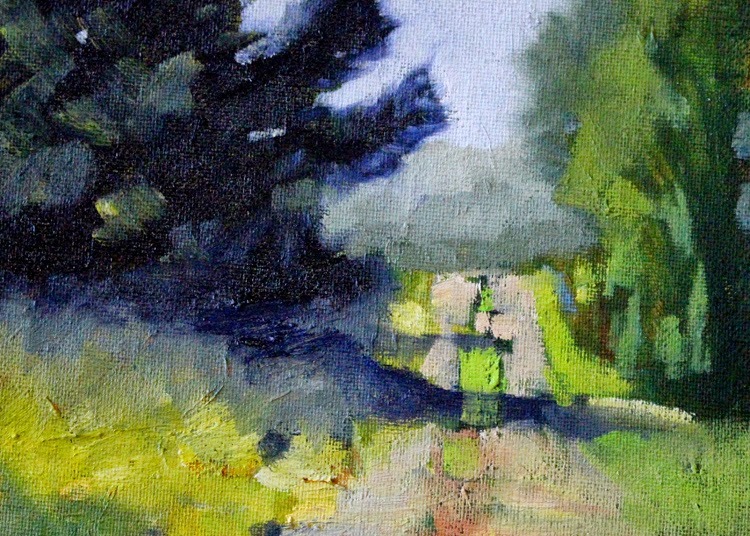 I have recently finished a series of small paintings that focus on roads. This little 6x8 inch oil painting is one of my favorites in the series. It leads viewers to wonder what is ahead and question where we are going. I love that! This series will begin to appear in my Etsy Shop as the paint dries. Some of the paintings will be available as reproduction prints, so visit the Landscape Gallery of my website to view available prints. Another option is to click on the tabs at the top of the page to view my small original paintings, prints, and abstract works. On my usual rotation of subjects, I have gravitated to birds. 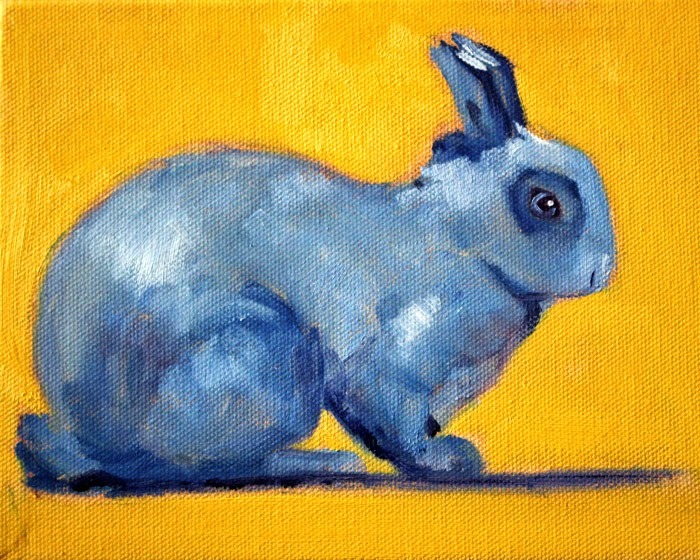 I like to paint these little fellows on small canvases. Small birds, small canvases seems appropriate, so this week I went bird crazy. As they dry, the originals will be listed for sale in my Etsy Shop. 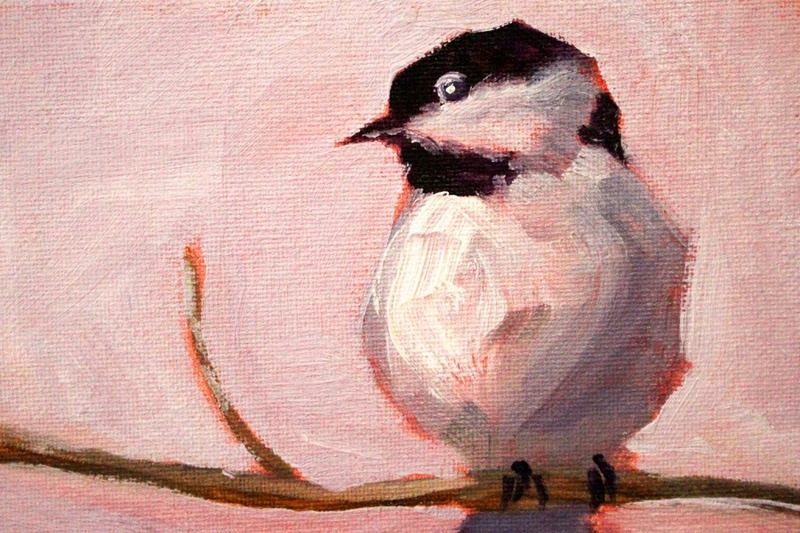 Of the five that emerged from my brush, this little Chickadee is my favorite. I love the neutral colors and the warm pink glow as he sits on a branch on watches the world go by. 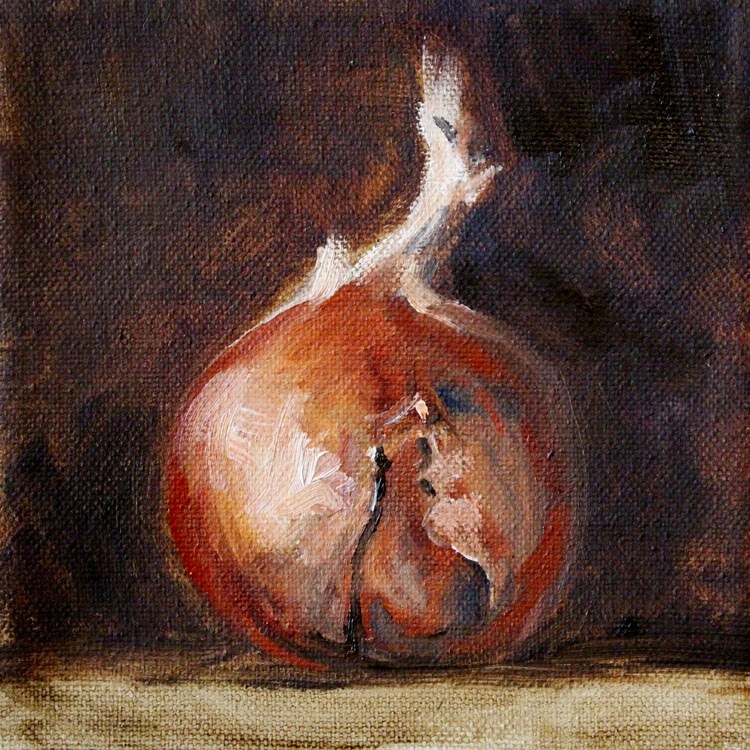 The original is 4x6 inches and was created with oil paints. Since the paint is still wet, he isn't for sale yet, but keep checking my Etsy Shop and the Birds and Animals link. He and some of his siblings will be showing up soon, If you can't wait, reproduction prints are available from my website or you can click on the Prints Tab at the top of the page and explore the Birds Gallery. A couple of months ago, my painting took a trip to Georgia as part of a photoshoot for This Old House Magazine. I am excited to announce that the January/February 2015 issue debuted today and this painting is a part of it. The article, Fresh Start, is about the remodeling of a 1940's home in Georgia and the family that owned it. This little 8x10 inch oil painting added color to an otherwise mostly white bathroom. It looks great propped up on a shelf just above the bathtub. You can see it here and if you scroll to the bottom of the text in the link, there is a credit to me and a link to my Etsy Shop. Needless to say, I am thrilled that my little painting is a part of this endeavor. Reproduction prints and posters of the painting are also available here or by clicking on the "Prints" tab at the top of the page. The original is for sale at this link. Second in my recent series is this collage composed of paper, paint, pencil, and ink. I used a variety of media in this experimental work. The original was created on 140 lb Strathmore paper. It is the best I have tried so far with minimal curling occurring in spite of a liberal use of wet paint, ink, and matte medium. I used Decocolor Acrylic Markers, Golden Fluid Acrylics, and some home made alcohol ink. That bright blue shape was created with a Caran d'Arche Neocolor Artist Crayon and a liberal passage of water and there are some scribbles done with Prismacolor Watercolor pencils. As you can see, it was a little of this, a little of that, and a whole lot of fun. Reproduction prints of this work can be purchased here, on my website. 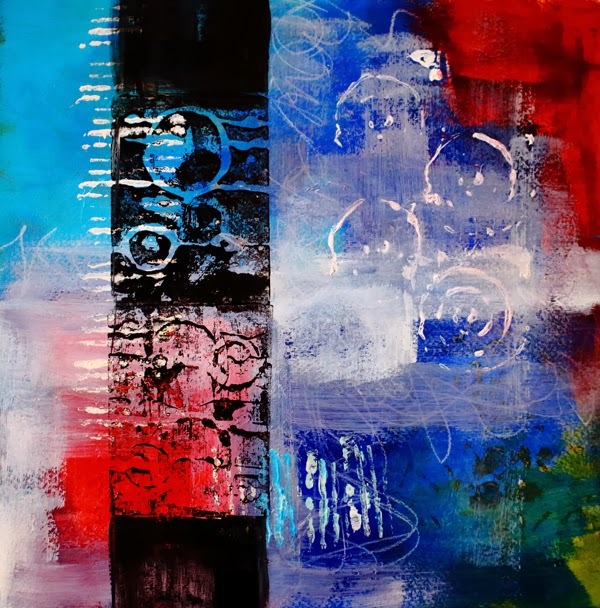 If you would like to see more of my abstract works, please visit the Abstract Gallery at my website or click on the prints tab at the top of the page. Recently my art has moved away from traditional subjects to the abstract. This is my usual cycle. I love to paint representationally, especially with oil paints, but inevitably, I need a break. This is when I move to the abstract. I like to explore new techniques and work with old media in new ways. This image is a mixed media collage that I recently finished. It incorporates paper, ink, pencils, and paint. Arranging paper shapes, embellishing with other media, and piling layer upon layer eventually results in a composition that I find pleasing. This image is one of a current series I am working on. I am exploring different grounds and have made some great discoveries. This image was created on an 11x14 inch mixed media paper by Strathmore. It is 140 lbs with a vellum surface and works better than most of the others I have tried so far. Reproductions of this image are available from my website, here, or by clicking on the prints tab at the top of the page where you can select abstract work from my galleries. This minimalist painting emerged from a limited palette of burnt umber, burnt sienna, English red, and white. It began with a wash of turpentine and umber and slowly built with touches of the other colors. Thinking about how the old masters were able to create beauty without the modern palette helped me appreciate once again the delightful compositions they created with just a few colors. The original 6x6 inch painting was created on a stretched canvas and is available for purchase in my Etsy Shop, here. Larger sized reproduction prints on canvas and paper are available at my website, here. You can also click on the tabs at the top of the page to view more of my original small format paintings, prints, or abstract works. 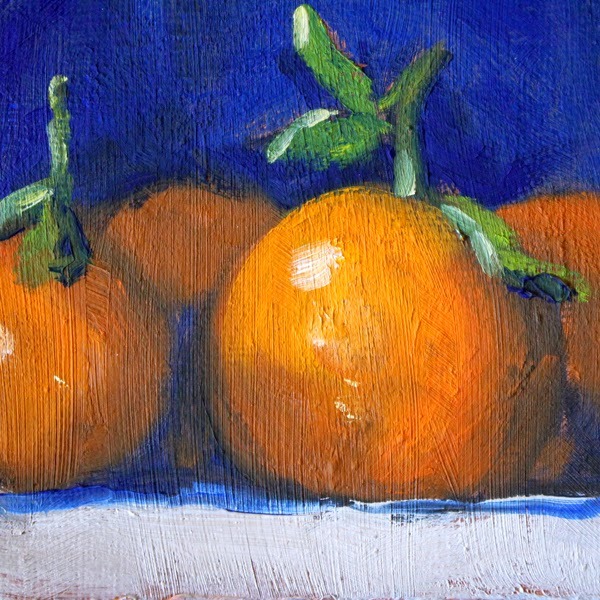 Little tangerines are the subject of this 3x3 inch still life oil painting. I don't like to paint quite this small, it is much more challenging than something twice the size, but I had several of these little mini canvases and decided to use them up. The original painting is for sale in my Etsy Shop, here, but you won't find any reproductions. Just like it is difficult to paint this small, I find it very difficult to photograph and create reproductions of work this size. You might also like to view some of my other original tropical fruit paintings, still life paintings, or perhaps the entire shop of my small format art. Every once in a while, a painting seems to create itself without any help from me. This little 6x6 inch still life oil painting was one of those creations. 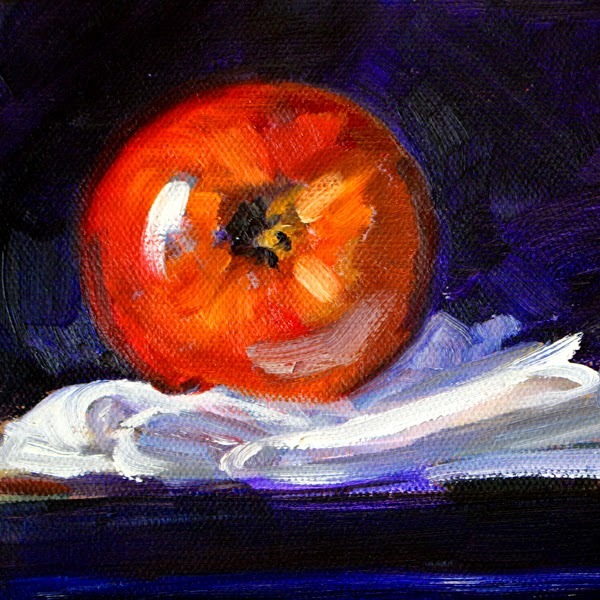 The minimalism of the bright red apple laying on a folded linen napkin was a delight to paint. I loved the contrast between the dark and the light, the bright and the subdued. The painting is available as a reproduction print from my website and will be listed for sale in my Etsy Shop as soon as the paint is dry. Hope you will stop by here and take a closer look. Recently, while walking the dog, I meandered toward a proud Evergreen. 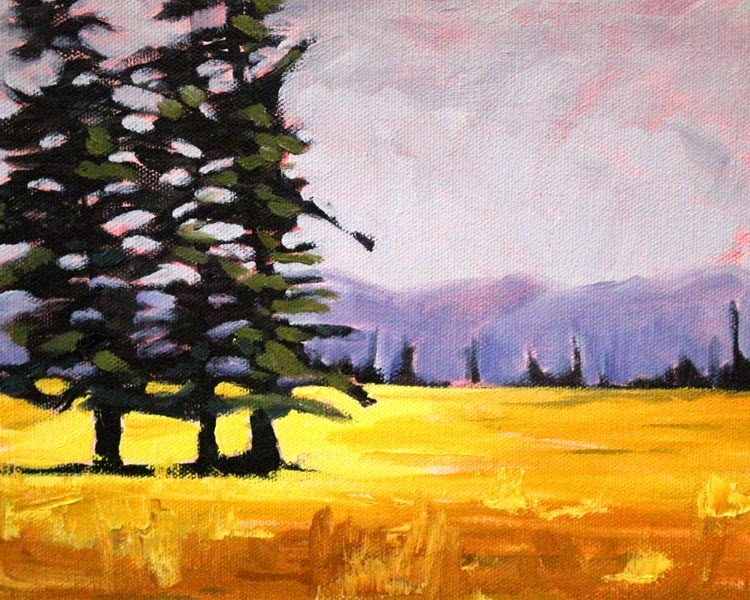 The lone fir tree stood tall in the middle of a meadow. It was strong and grizzled having apparently withstood wind, rain, and snow without the support of any other trees. As the breezes tossed its branches and the sun made it sparkle, I knew I had to paint the fellow. I loved the texture and color of the bark and the multitude of greens apparent in its branches. After I finished, I was glad to have taken the time to capture the portrait of this soldier. The painting is 11x14 inches on stretched canvas and was created with oils. The original painting is available for purchase here at my Etsy shop. Reproduction fine art prints are available in a variety of sizes on paper and canvas at my website here. A rabbit convention took place recently in my studio. Pets and wild rabbits from the neighborhood all came together in my mind and started rambling their way toward my canvases. This little bunny is the most recent to complete his stay. He was created with oil paints on a 6x8 inch canvas. You can find him hiding here with some of my other animal paintings at my Etsy Shop. If you miss him, reproductions are available here at my website in a variety of sizes on paper or canvas. You can even get him framed and ready to hang. Early in the morning, just as the sun comes up, little rabbits creep out from their burrows and venture through my neighborhood looking for a tasty treat, hopeful that the dogs and children will be absent. 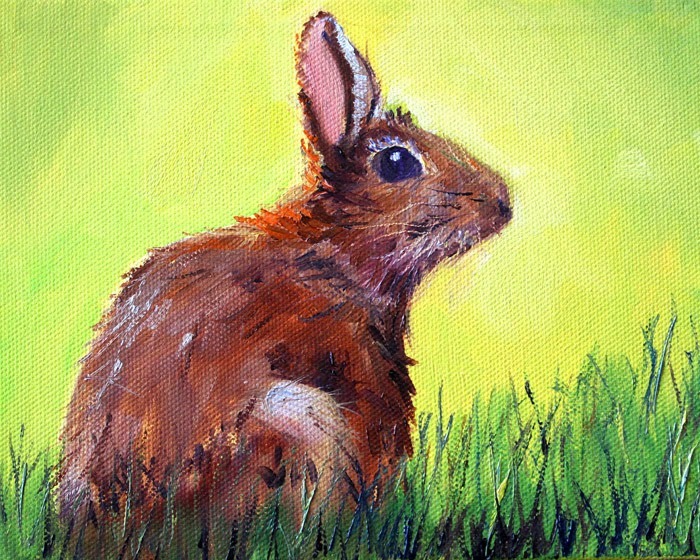 It was one of those sweet dawn bunnies that inspired this oil painting. I tried to capture the morning light, his curious nature, and the fearful awareness that must be part of his everyday life. The original painting is 6x8 inches on stretched canvas. It is available for purchase in my Etsy Shop along with some of my other small paintings of birds and animals. Bartlett pears start appearing on the trees in mid August and share their sweetness into the fall season if stored well. 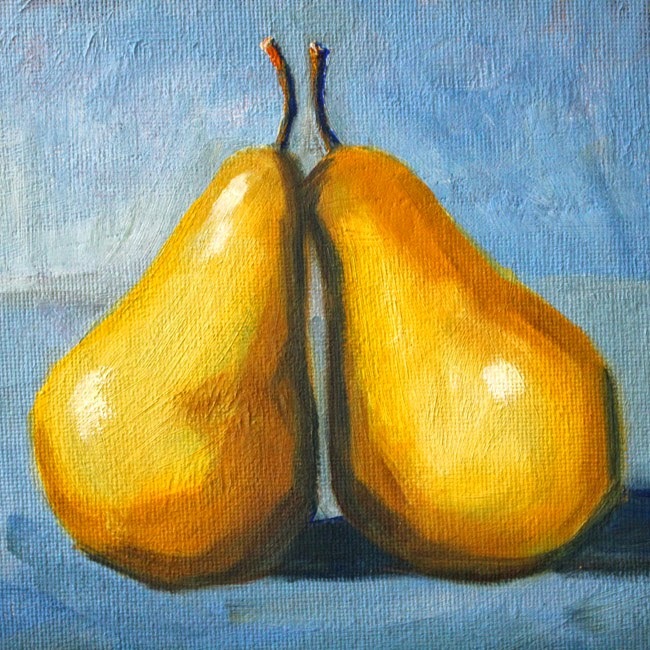 This contemporary still life oil painting was inspired by two yellow pears that didn't last long, not because of storage, but because of flavor. They were devoured soon after their debut. As they tilted toward one another, it was as though they were in love. All that is left is this portrait of their torrid affair. Reproductions of this oil painting that documents their brief affair are available at my website, or just click on the prints tab at the top of the page. If you are a regular reader of my blog, you have probably noted a new look and some added features. At the top of the page there are tabs that will take you directly to my original small paintings and one that will take you to a gallery of my reproduction prints. I'm excited about the updates and hope my readers will find them helpful. I will continue my blogging and sharing as I wander through my artistic pursuits. Today I am sharing a small painting that will not be reproduced. 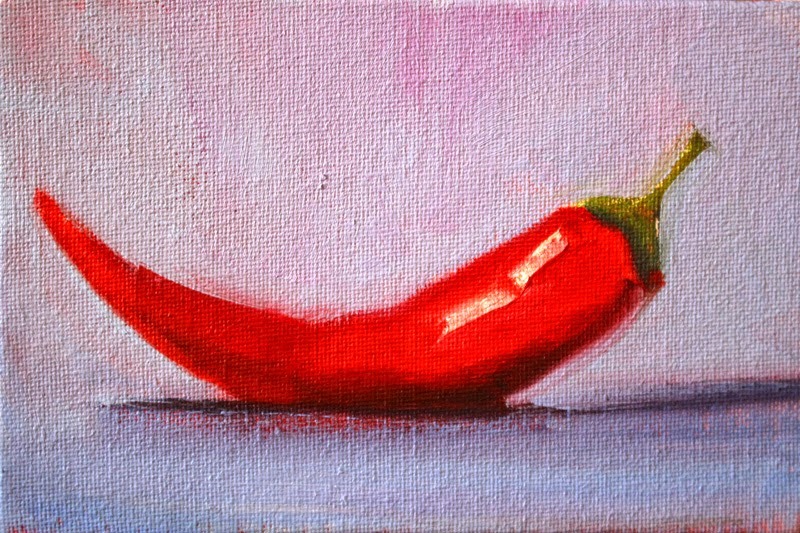 It is 4x6 inches and was created in oil paints. It can be purchased here from my Etsy shop, but you will not find it available as a reproduction print. When it is gone, it's gone. 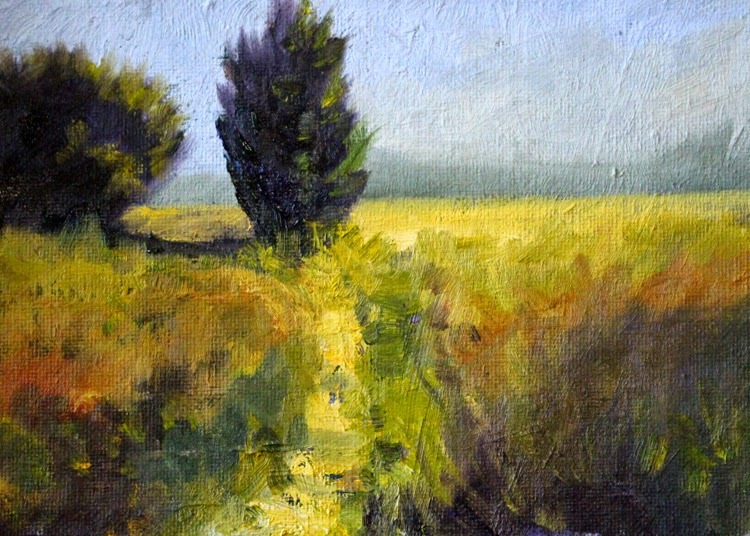 A single track bike path through the prairie land of Central Oregon inspired this original oil painting. Rocks, sagebrush, cheatgrass, and an occasional tree take up much of the landscape and help contribute to the beauty of this high desert adventure. The original 5x7 inch painting is available for sale at my Etsy Shop and reproductions are available in a variety of sizes from my website. If you've never visited this area, it is a good time to start planning a trip. The sun shines most of the time and who can complain about that? The first rainstorm of the fall season hit hard today. Pouring rain, fog, and a dismal sky have coerced my thought patterns away from landscape paintings to the confines of my studio. 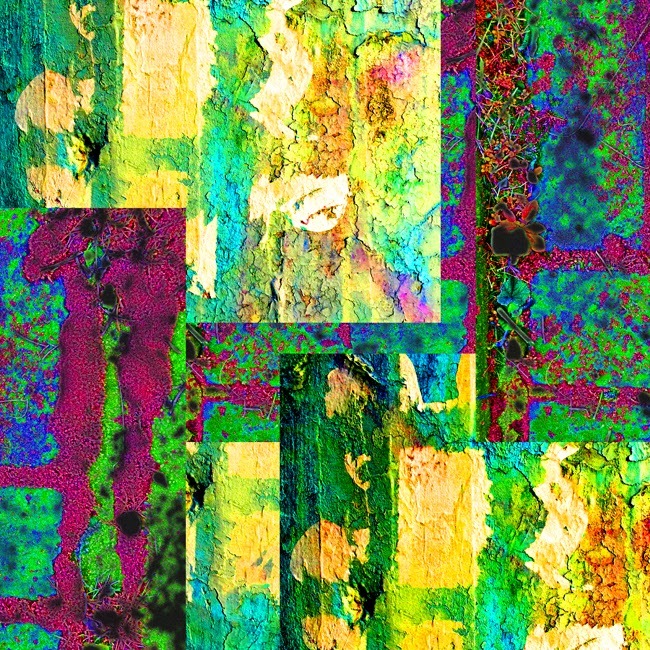 As I tried to get myself moving, I found this colorful abstract I created a few weeks ago. 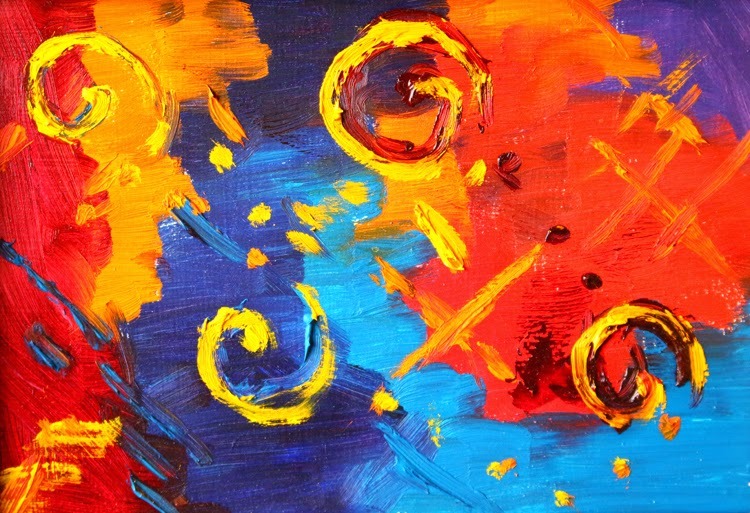 The bright colors, the movement and the textures are motivating me into a expressive world of abstraction. 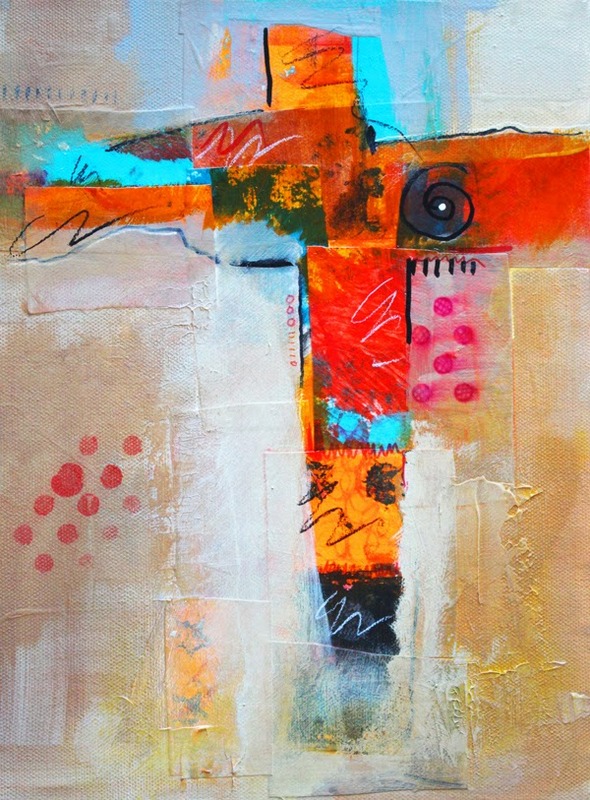 The original mixed media painting was created on a 12x12 inch square format canvas. It can be purchased by contacting me from my website or as a reproduction up to size 36x36. 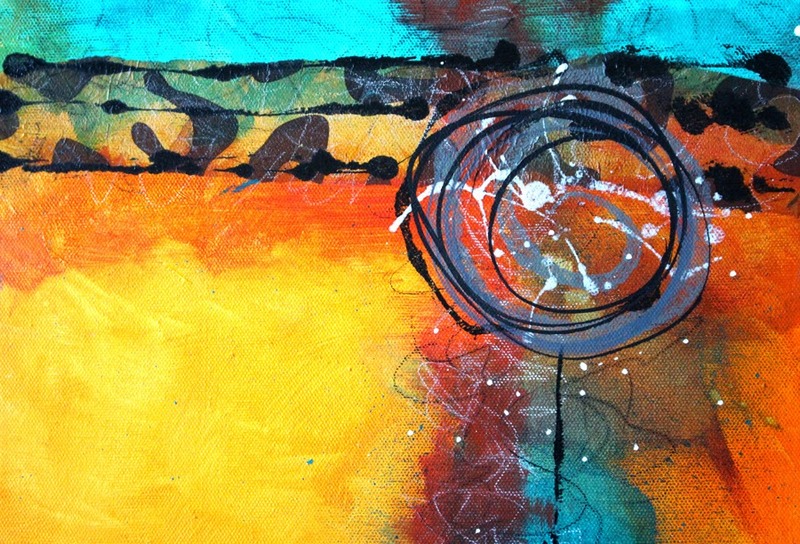 Now I'm back to the studio to create some more abstract circles paintings. If you regularly follow my blog, you know that I like to work in a series. I move from landscapes to still life paintings, and then to abstract subjects. Then I cycle through again. Painting a variety of subjects and using different approaches helps to keep my work feeling fresh and exciting. 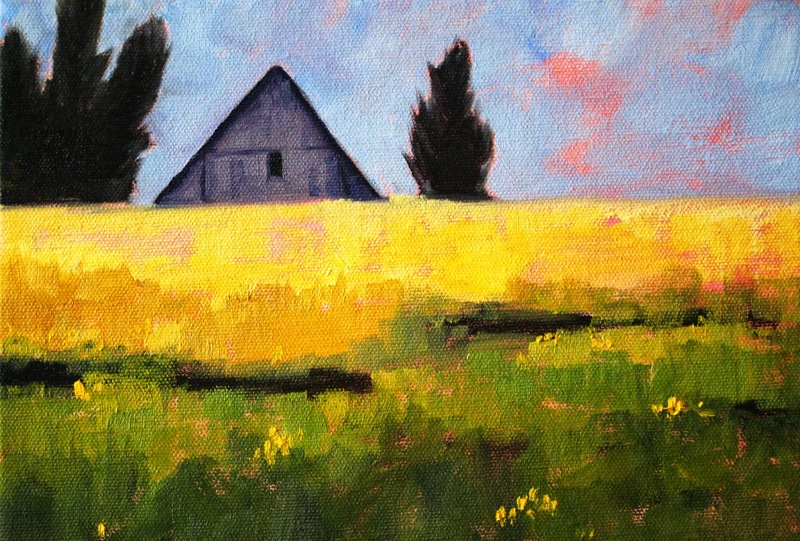 Last week I focused on a series of still life paintings and this week I am working on Oregon landscapes. Since I live in the Northwest and travel the states of Washington and Oregon often, painting the landscapes of this area feels homey and natural. 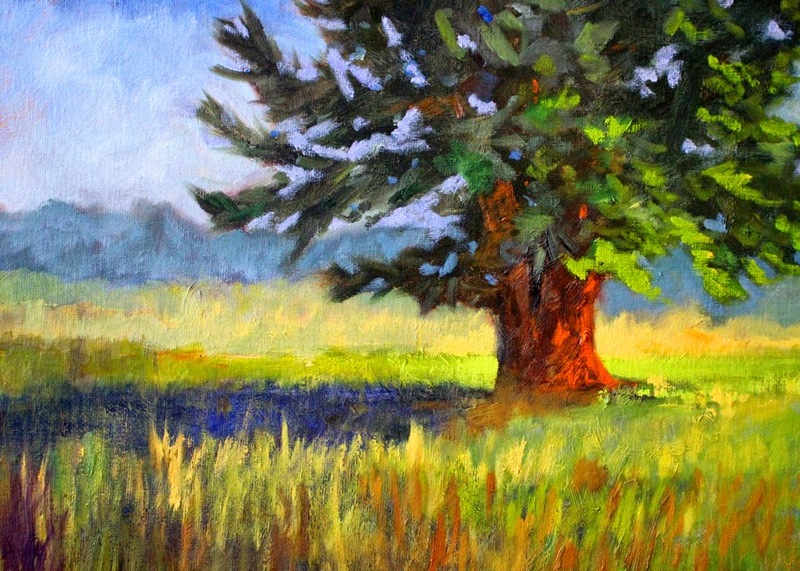 This painting is one of a series of Oregon landscapes that I completed this week. Prints are available from my website and, as soon as the paint is dry, I will sell the originals in my Etsy Shop, Small Impressions. The original oil paintings are 5x7 inches, but the reproduction prints can be made in a variety of sizes, some of them quite large. I hope you will visit my website and see the rest of this series and visit my Etsy Shop to see some of my small original oil paintings. Visiting the farmers' market recently led me to painting peaches. Bright, colorful, and juicy, my brush created several square format paintings of little fruit gems. 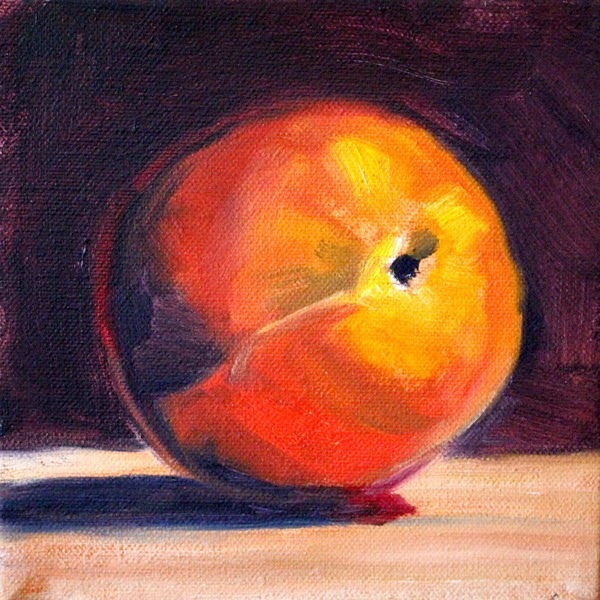 The original oil painting is 6x6 inches on stretched canvas. I'm also excited that this painting can be reproduced in square format up to size 36x36 inches, just right for a kitchen wall. In addition to this little creation, I have a collection of square format art that needs to find a home. In the next few weeks I'll be adding to this collection. I hope you will stop by. If you are interested in purchasing the original, I will be listing it in my Etsy Shop in the very near future. The autumn season has arrived. Sunshine and cool temperatures make September one of my favorite months. 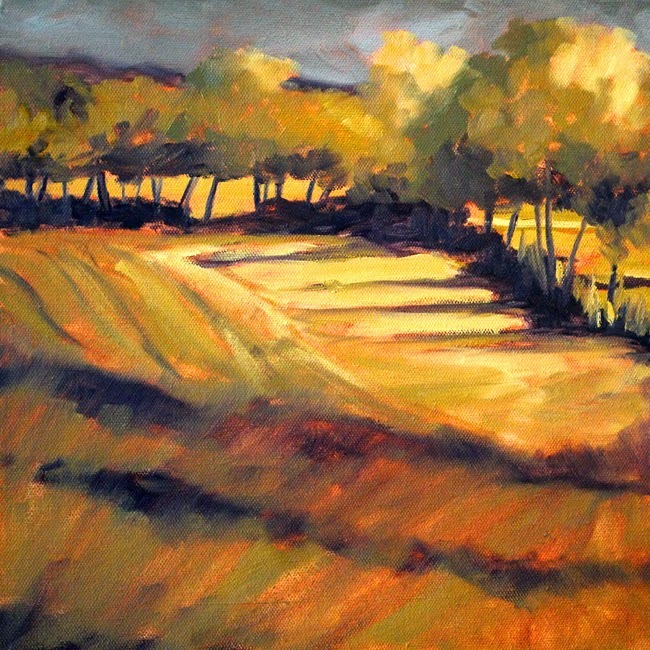 Strolling along a country road, noticing the changing colors of the vegetation, and feeling good was the inspiration for this square format landscape painting. It was created with oil paints on a square canvas. Although the original was a 12x12 inch canvas, reproductions up to 36x36 are available from my website. I hope you will stop by for a visit. August and early September are one of my favorite times to paint still life. The produce is coming on fast and furious and I am constantly inspired to paint the harvest. Right now I have green beans and tomatoes that I can hardly keep up with, but the most beautiful of all produce is the fruit that is available. 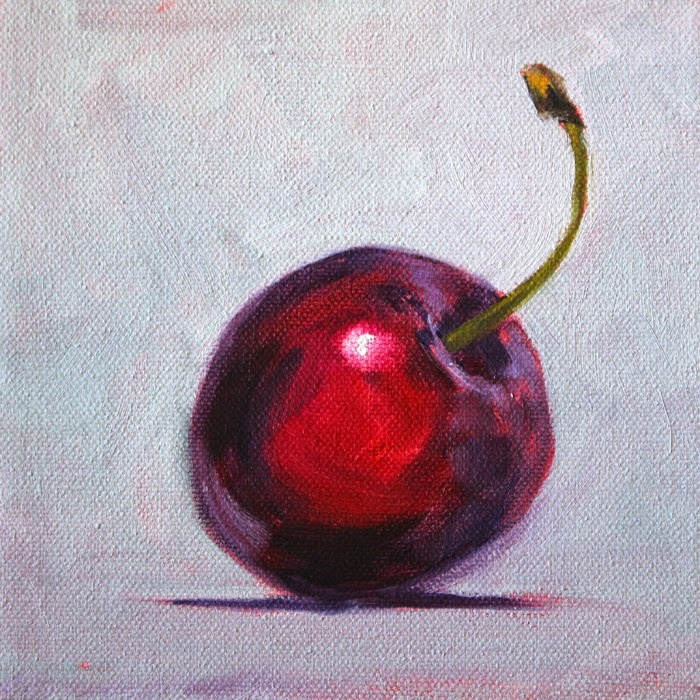 This painting was inspired by a rich red Bing cherry. The full juiciness and color caused me to create this 6x6 inch still life oil painting. That's it! A single cherry! The original can be purchased here at my Etsy shop or reproductions in all sizes are available from my website. Now, I'm off to gather more inspiration from the wonderful season of fall harvest. One of my favorite designs is the cruciform. 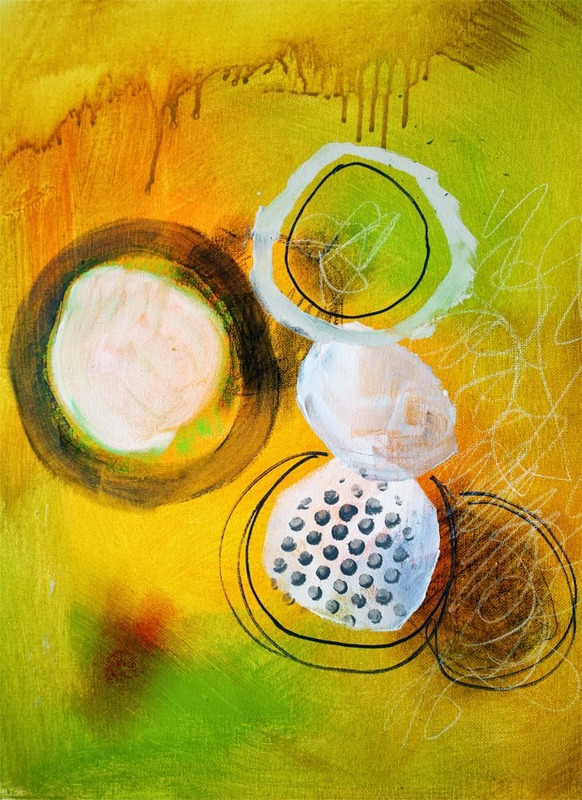 In this abstract composition, I played with paper, paint, ink, and charcoal on a canvas surface. 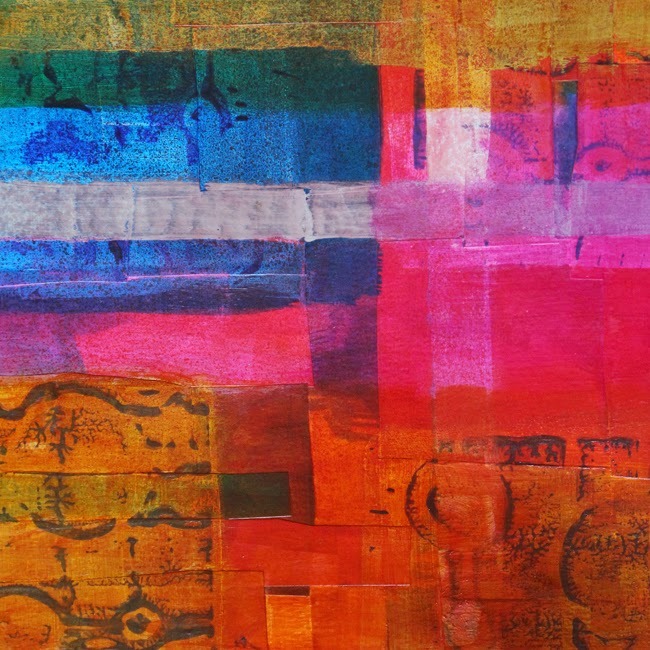 The original work was created on a 9x12 stretched canvas, but with the capabilities of modern digital photography, small collages can be reproduced as very large abstract paintings. If you would like to purchase the original, please contact me at smallimpressions@hotmail.com. Reproductions are available from my website here. I hope you enjoyed looking and will stop by for a visit. Second in my recent series of little landscape paintings is this 8x10 oil on stretched canvas. It was inspired by one of those rare stormy summer days when the wind is blowing, the rain is pouring, and then the clouds part and the sunlight streams down giving a little glow to the world. The original will eventually be listed in the Barns and Buildings section of my Etsy Shop. Fine art reproduction prints and posters are available from my website, here. I hope you will stop by and take a look. Abstract paintings have been my staple for quite a while, but recently I felt a need to get back to some representational work. 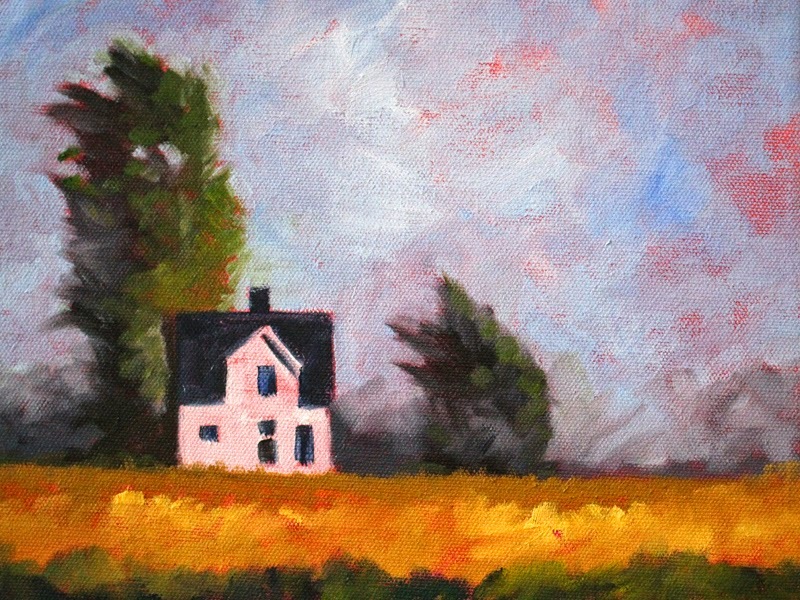 This is one of three little 8x10 landscape paintings that I recently finished. It was fun to go back to oils and brush up my skills. Both the original and reproduction fine art prints and posters are available for purchase. The original painting is listed in my Etsy Shop, here. Reproduction prints and posters are available from my website, here. I hope you will stop by. 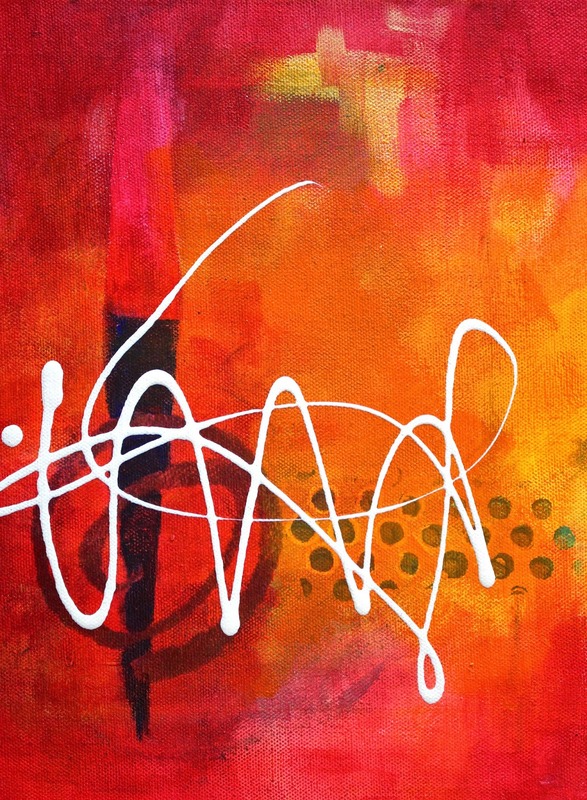 The second in a series of abstract paintings inspired by the beautiful calligraphy of the handwritten signature, this painting was created using acrylic paints on a 9x12 inch stretched canvas. Reproduction prints and posters of this painting are available here, in my abstract gallery at Fine Art America. The first in the series is also available. Check out my entire portfolio by visiting this gallery. Working with the lines and circles motif, I'm still creating my latest abstract series. This image was developed with mixed media and acrylic paint on a 9x12 inch stretched canvas. As I worked, my mind kept gravitating toward the colors of the Southwest, turquoise, yellow, and orange. Scribbles and swirls of paint and charcoal with a few strips of patterned paper combined for the finished painting. Fine art reproduction posters and prints of the image are available here, in my Fine Art America Abstract Gallery. I hope you will stop by for a visit. 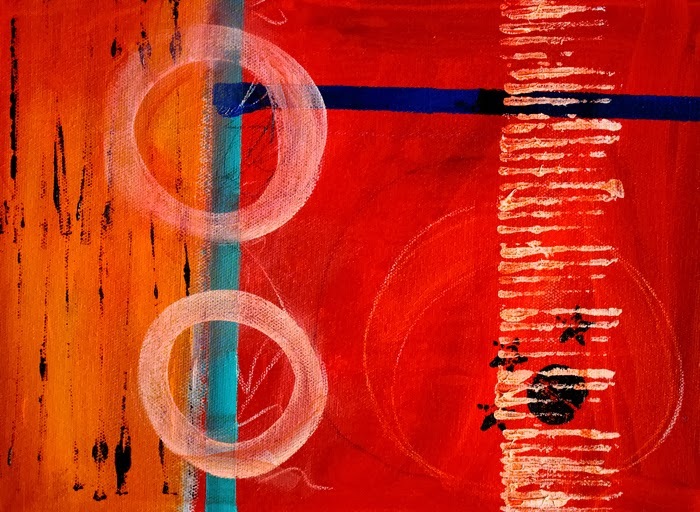 The second in my series of rings and circles abstract paintings took a while to post, but here it is. I'll admit it; I've been procrastinating. I've had a new laptop for months, but don't like installing software. A history of installation trouble kept me from moving forward. So there--my excuse for irregular posting. Today I finally did the work and put the software on the new laptop. I guess there are no more excuses. Information about this original painting, reproduction prints, and posters are available from my website. I hope you will visit. On the road for the past month, my travels have created a big challenge for keeping my followers updated on my work, but I'm finally home and it feels good to get back to my usual routine. I created this original 16x20 inch abstract before my travels began. 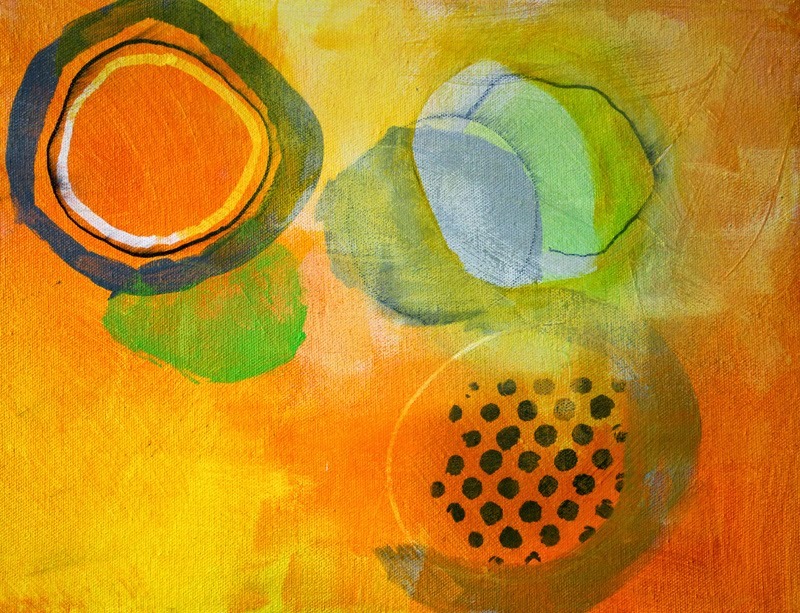 I was inspired by of Jane Davies and the abstracts she creates. We have a lot of similarities in our work and a lot of differences. It seems we are both intuitive in our creations and work with organic shapes, colors, and designs. However, from my research, it seems she works on paper most of the time. My work tends to be on canvas. If you explore our work, I think you'll see some of the similarities and differences that I discovered are apparent. 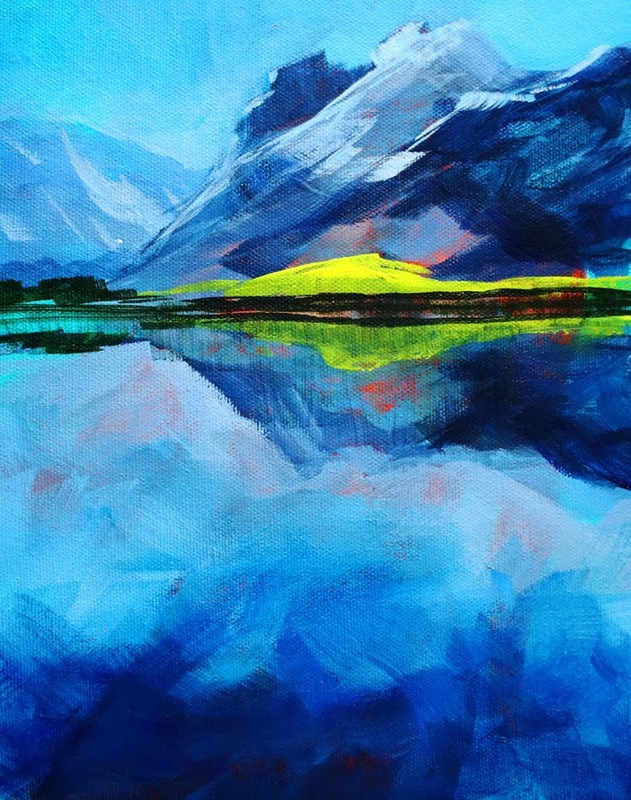 Reproduction prints of this painting are available from my gallery at Fine Art America. I'm working on some companion pieces in this series which I will be posting soon. After the dark and gloomy days of winter, it is refreshing when blooms finally begin to appear. 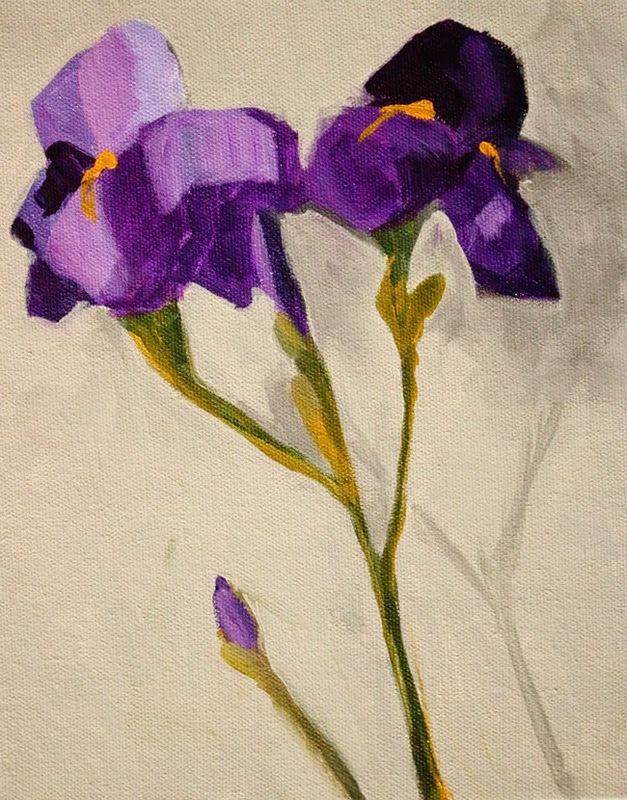 The Iris blooms that inspired this minimalist floral painting blessed my backyard and gave the rest of my garden a role model to follow. I couldn't resist painting this early leader of the garden parade. The original painting is on canvas and is 8x10 inches. Reproduction fine art prints are also available. Visit my website and this page for details on sizes, surfaces, and prices. 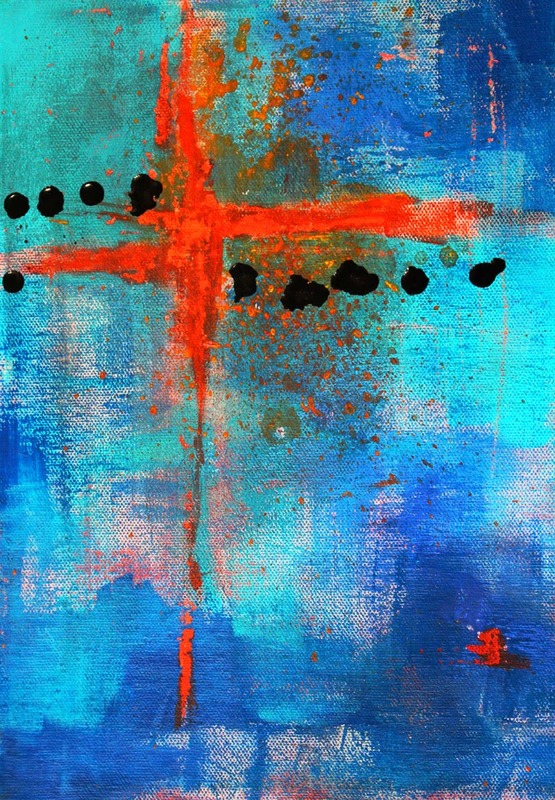 Entitled Intersections, this painting is all about things connecting. It is the intersection of dark and light, of black and white, of pattern, of color, of shape, and of media. Acrylic paint, acrylic ink, charcoal, and chalk are all a part of this little intersection. Reproduction prints are for sale from my web site. There are many options for reproduction. I hope you will stop by and visit. Adding charcoal and chalk to a textured burst of color has been happening with my creations lately. Something about making a good scribble on top of a painting feels great. Color, movement, and energy combine for a satisfying day of painting. This painting is available as a reproduction fine art print, canvas print, or framed print from my website. 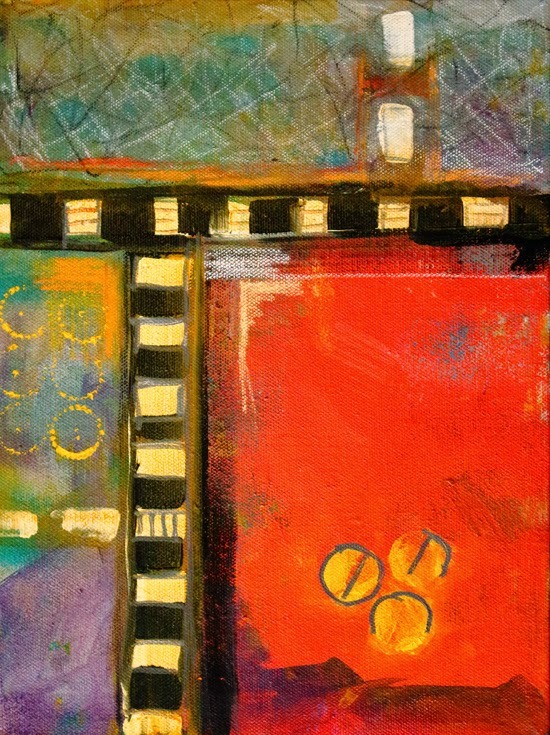 I hope you will stop by for a visit and to see some of my other abstract and mixed media paintings. Mixed things up today with some acrylic paint and charcoal. 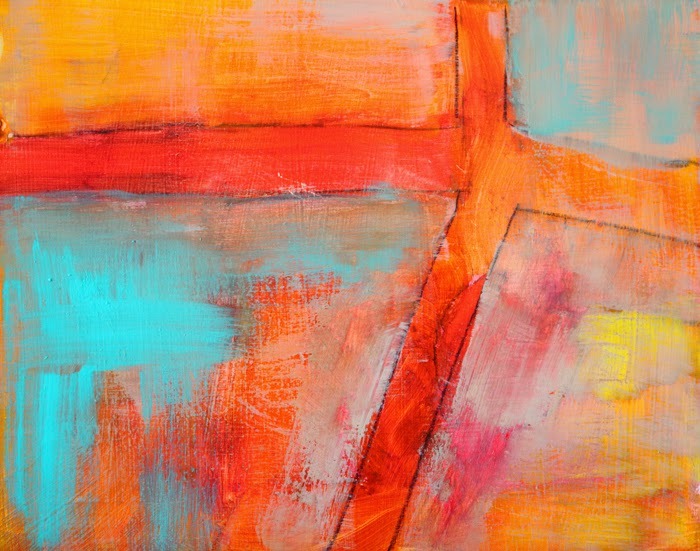 I love the contrast between the orange and teal and the textures in this fun little abstract. The painting is available up to a size of 37x48 from my website. I love the miracles of modern photograph that can take the original 8x10 painting and make a beautifully detailed reproduction in a great big size! As promised, here is the second painting in the Swirl Series. This one is called "Texture." 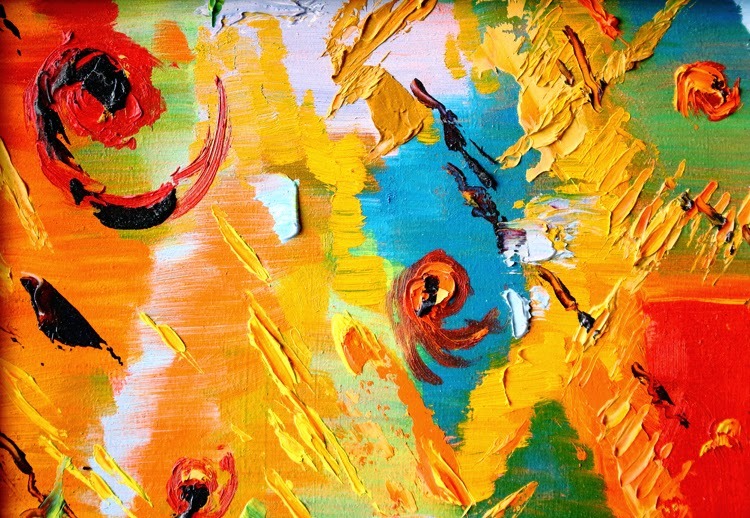 I love the thick, swirling paint and the texture that was created with palette knife and brush. So much color fun! Reproduction fine art prints are available here. 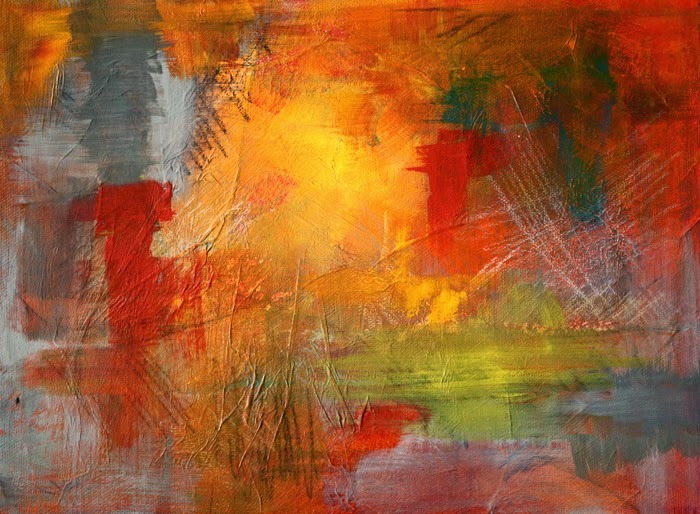 You can also see my other abstract paintings by visiting the abstract gallery at my website. It is official: This March has broken the record--most rain ever in the month of March for Western Washington. As I watched it pour down this afternoon, I decided it was time to clean the studio. It felt pretty good. While I was at it, I ran across a delightful pair of abstract paintings that went to the Juried Show at the Washington State Fair a few years ago. They were framed in matching gold frames and are delightful. I dusted them off and took a few photos. This one if now for sale as a reproduction fine art print at my website. I will be uploading the other in the next few days. The originals are going up on the wall. It is time for a change. Bright colors--no more rain! 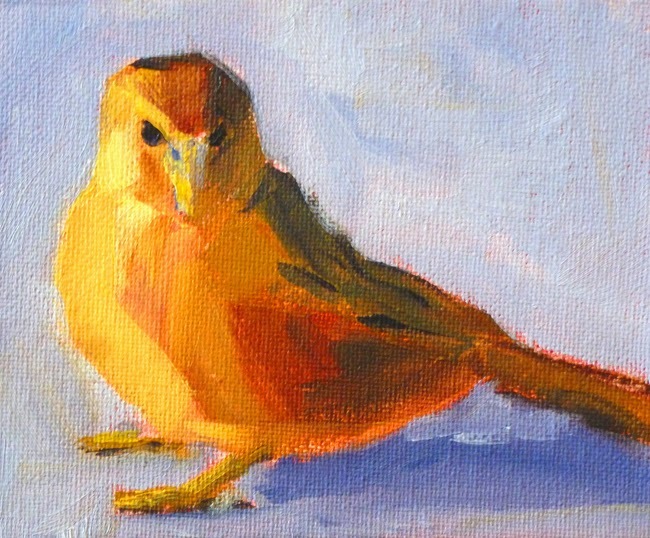 With spring, another little bird painting has slipped off my paintbrush. She is painted in oil painting on a 4x5 inch canvas panel. See the original here in my Etsy Shop. This past week spring seems to be trying to make itself present. 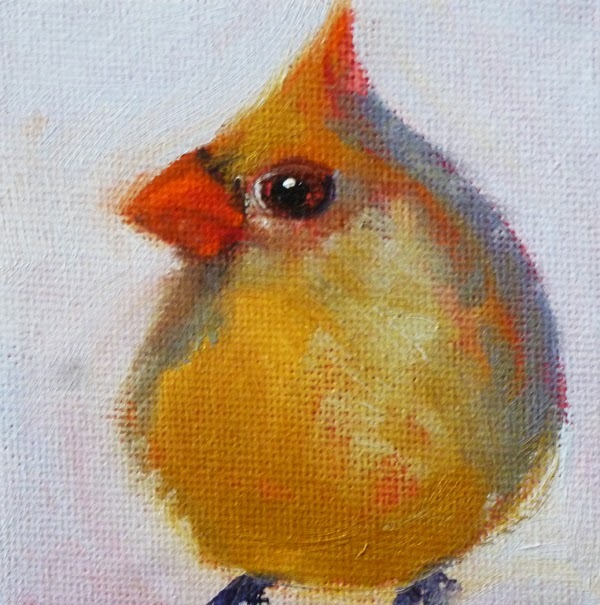 In doing so, I have been inspired to paint little birds. The one above is a very tiny baby on a 3x3 inch canvas panel. The one below is a robin trying to check out the world. 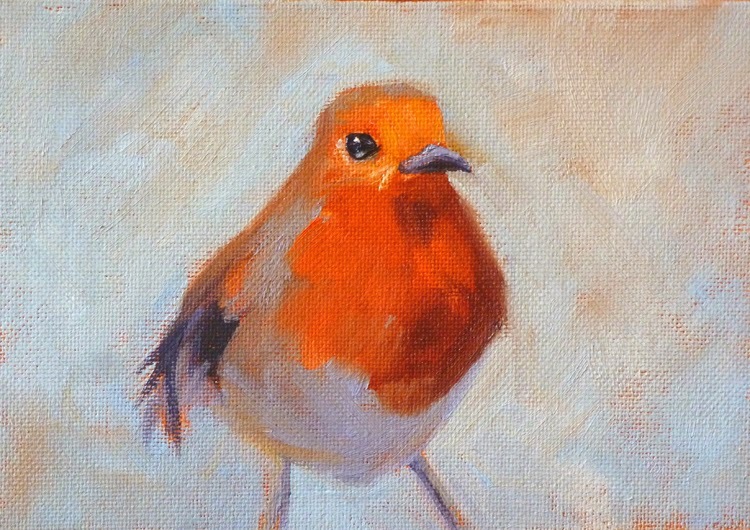 The robin is 5x7 inches. Both are available for purchase from my Etsy shop. They are each one of a kind, so when they are gone, they're gone for good. You can view both of this in the Birds and Animals section of my shop or individually here and here. 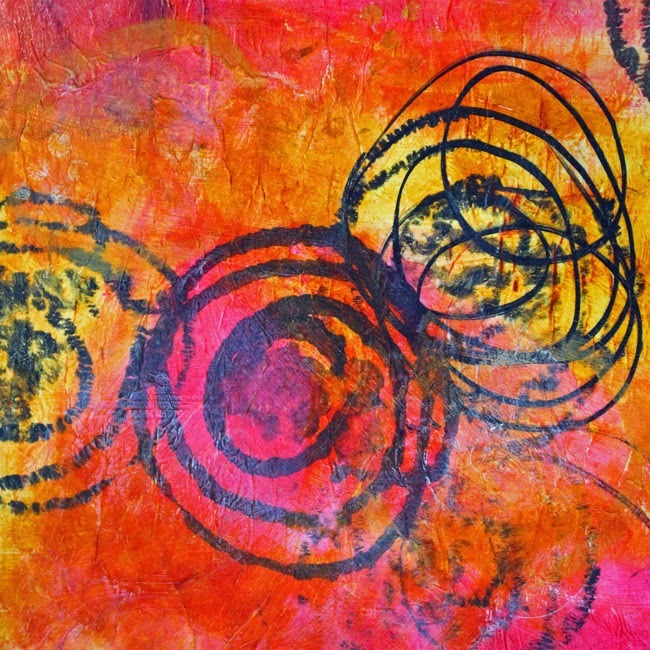 This painting is called Color Scrap because it resulted from my playing around with color, stamps, chalk, and ink on a scrap of watercolor paper. It was a fun experiment. I rarely paint in watercolor anymore, not for any particular reason except that my studio is set up with easy access to my oils and acrylic paints instead. On this occasion, I noticed a block of watercolor paper which hadn't been used in a long time sitting against the wall. I grabbed it to experiment with some home made stamps and linoleum cuts. It was just plain fun experimenting. When I finished, the block went back against the wall without any further intention. Then, this morning I noticed it again and I liked what I saw. Photographing it resulted in a really exciting abstract painting. Reproductions are now for sale from my website. Please visit here to explore sizes and prices. There are quite a few reproductions of my abstract paintings in the Abstract Gallery. I hope you will stop by. A sloshing good rain storm hit my town this weekend. Twelve hours without power. I couldn't think of anything better than creating something exciting. So, while the heat was off and the studio got colder, my paints kept me warm. I painted and scraped and splotched, and dropped and concluded the day with this wonderful painting and a good attitude. Reproductions are available in a variety of sizes up to 33x48 inches from my website here. If you are interested in purchasing the original 9x12 inch painting, please contact me at smallimpressions@hotmail.com. You can view some of my other work at this link.